Burger patties, 4 oz. each --- 4 ea. Fresh thyme, leaves picked --- 1/2 Tbsp. Combine TABASCO® Green Sauce in with buttermilk; place burger patties into mixture. In a medium pot over medium heat, add butter and onions; cook until translucent. Add sausage in quarter-sized crumbles. Add 2 cups flour and thyme; stir until flour has absorbed the butter. Stir espresso, then slowly pour in whole milk; reduce to a low simmer. Add TABASCO® Original Red Sauce to season before serving. Dip each soaking burger patty into remaining 1/2 cup flour, back into the buttermilk, then once again into flour; fry burgers at 350ºF until golden brown. Place each crispy burger atop a biscuit bottom so it looks like a muffin top. 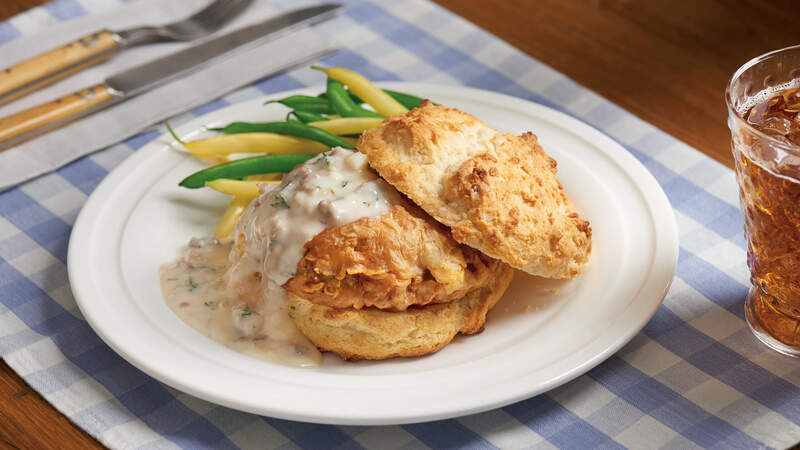 Ladle sausage gravy over top, lean the top of the biscuit on the side, and garnish with minced chives.